As you know, we love to show you new proyectoss on Kickstarter, so this time we present the second version of robot Romotive: Romo. 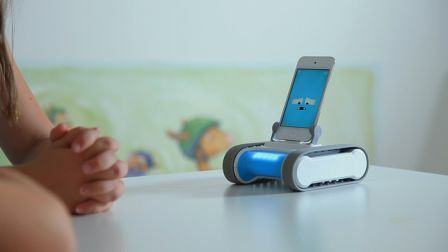 Romotive published the draft of its first version of a toy robot that was managed from the iPhone which failed to reach the minimum budget to start being sold. Now, plans to launch its second project with technical and apparently improved version. This new version is so compact robot Romo as above and includes various functionalities such as transmission and reception of video and audio, the compatibility of view from a computer, the autonomous navigation and even facial recognition. Equipped with a rechargeable battery which lasts up to 8 hours autonomy after a full charge, Romo speed exceeds its first version and is capable of tilting the head (in this case, your iPhone or iPod Touch). It's really cool and fun, and can be used to support daily tasks (such as pushing a cup of coffee to you) and toy (designed especially for children). If you are interested in this new project, you can support the idea at this link Kickstarter for the price of $ 150 (about 115 €), and you will be the first to receive your new virtual pet next January. 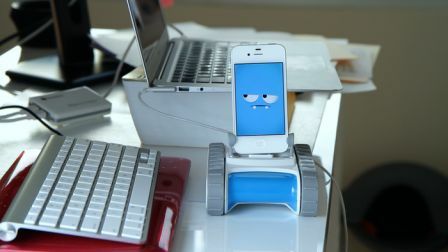 To use it, you need the robot and the iOS device, and download the official app from the App Store Romotive. So far, they have raised $ 95,000 of the $ 100,000 needed to launch the project to the market, it seems that Romotive will succeed in his second project with your little robot.